Going below the surface for better watershed health – Amid record growth, Salmon-Safe development holds the key to improving fish habitat and water quality in Puget Sound. Each spring and fall, onlookers gather at the Ballard Locks for a glimpse at a phenomenon thousands of years in the making: adult salmon migrating upstream to spawn, and smolts journeying into Puget Sound for the first time. Only, the scene from behind the viewing windows stems from recent human activity, rather than Mother Nature’s intent. A century ago, the completion of the Lake Washington Ship Canal connecting Lake Washington to Puget Sound disrupted the routes of coho, sockeye and Chinook salmon. With the lowering of Lake Washington in 1916 as part of the ship canal project, the Black River — formerly the corridor for salmon heading into Puget Sound via the Duwamish River — dried up. Salmon eventually reoriented toward the northern-most part of Lake Washington, and then onto the ship canal and past Lake Union. Today, factors like predation, water pollution, rising temperatures and shoreline development continue to pose other challenges. Yet nothing has so drastically imperiled salmon species as increased urbanization. And specifically: the loss of permeable soil to impervious roofs and roadways. 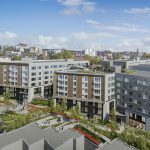 Vulcan is in the latter stages of construction on Batik, a multifamily development in Yesler Terrace with bioretention planters, vegetated roofs and water-efficient irrigation. With each rain event, heavy metals and motor oil are swept into local receiving waters through stormwater runoff, rather than being filtered more gradually through natural soils. As the Puget Sound region continues to experience record-breaking development, the degree to which green stormwater infrastructure standards are implemented by mission-oriented developers and landowners will set the tone for how we protect watershed health during this time of unprecedented growth. To passersby, the Salmon-Safe educational signage surrounding Vulcan Real Estate’s office and residential projects in South Lake Union stands as a reminder that this place was once a natural part of the watershed where salmon thrived. Construction fence signage highlighting the Salmon-Safe commitment to water quality protection surround some of Vulcan’s most high-profile projects, including the new Google and Facebook campuses in South Lake Union. So far, Vulcan has finished or started eight Salmon-Safe-certified projects, and at least eight more are on the horizon. Portland-based nonprofit Salmon-Safe has made headlines in recent years for certifying high-profile sites including Sea-Tac Airport as the first Salmon-Safe-certified airport in the U.S. and Seattle Children’s as the first hospital campus in the nation to earn the certification. But its story began 15 years ago in the farms and vineyards of Washington, Oregon, California and British Columbia. Since then, Salmon-Safe has certified 95,000 acres of farm and urban lands that exhibit good land-use practices and a commitment to protecting salmon habitat and water quality. In 2008, Turner Construction approached Salmon-Safe to explore recognition for its environmentally innovative work on Nintendo’s sprawling campus in Redmond — a hub for salmon habitat. With that, a new standard for construction was implemented with the goal of achieving these high standards wherever Turner works in the Puget Sound region. Some stormwater from Capitol Hill feeds into the Swale on Yale. In 2014, Salmon-Safe extended its oversight to real estate development with the aim of creating a certification that plays a complementary role to LEED, the U.S. Green Building Council’s system for rating the environmental performance of a building. This year, Vulcan Real Estate became the first Salmon-Safe accredited developer in the world. 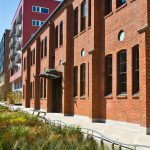 Its newest Seattle projects in South Lake Union and Yesler Terrace have gained Salmon-Safe certification — among the first in the city to do so — through the extensive use of bioretention planters, vegetated roofs and water-efficient irrigation. Additionally, Vulcan now requires all of its general contractor partners to be accredited by Salmon-Safe for zero sediment runoff in construction. The group of accredited contractors includes Exxel Pacific, GLY, Lease Crutcher Lewis, Sellen, Turner and W.G. Clark. These firms make a practice-wide commitment to achieving Salmon-Safe’s zero pollutant standard on every project, even on sites that aren’t being considered for certification. Among the responsibilities accompanying Vulcan’s developer accreditation is to share key learnings both internally and with other developers, with the aim of moving the marketplace toward a higher development standard. To qualify for Salmon-Safe certification, each project is required to meet the Salmon-Safe development principles of protecting habitat and water quality during construction, incorporating strategies that treat stormwater and provide ecologically functioning habitat, as well as a commitment to water conservation methods. An interdisciplinary team including scientists from local universities and private-sector partners is then called on to conduct each assessment on behalf of Salmon-Safe. This includes a visit to each project site before a certification is issued. Vulcan’s full-block residential development at 1255 Harrison St., called Sitka, is among the newly certified projects. Slated for completion in 2018, Sitka includes the installation of the second half of the Swale on Yale joint-venture project with Seattle Public Utilities to treat stormwater before it reaches Lake Union — part of the region’s new salmon migration corridor. The newest two-block-long swales will be situated on the eastern and western margins of the development, along Pontius and Yale avenues. The first half of the Swale on Yale was completed in 2013 alongside Vulcan’s Stack House and Supply Landry development, one block north of Sitka. Together, the four swales will treat stormwater from 435 acres of Capitol Hill streets and sidewalks each year. At completion, about 190 million gallons of stormwater will be treated annually. This voluntary retrofit of a storm system in an urban setting is the first of its kind in the U.S.
Green roofs will also be installed atop Sitka and its ground-floor awnings. All other roof drainage will be directed to one of five bioretention planters. In Yesler Terrace, Vulcan is in the latter stages of construction on Batik, a multifamily development at 123 Broadway. It has bioretention planters, vegetated roofs and water-efficient irrigation. 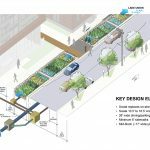 Its stormwater management features will be particularly evident along both sides of Fir Street, where rain collected from the roof will empty into street-side planters. Stormwater from approximately 80 percent of the project’s surface area will be treated on-site through the use of vegetated bioretention structures. The first half of the Swale on Yale was completed in 2013 alongside Vulcan’s Stack House and Supply Landry development. A 2015 report published by the National Oceanic and Atmospheric Administration captured the startling impact of stormwater pollution on our urban watershed. Researchers found that adult coho salmon died in less than three hours after direct exposure to road runoff. The silver lining: The study found that running the same toxic cocktail through layers of compost, soil and gravel — mimicking pre-development conditions by using conventional stormwater management practices — led to zero salmon deaths. Researchers then offered readers an important takeaway: Green stormwater infrastructure should be incorporated as much as possible to preserve and protect watershed health. Yet for land owners and developers, a key barrier to adoption remains: a lack of expedited permitting and financial incentives that prioritize green site development are otherwise available for high-performance buildings. Until that changes, mission-oriented developers, land owners, contractors and others will need to recognize their role in protecting our urban watershed. The stakes have never been higher. Lori Mason Curran is Vulcan Real Estate’s investment strategy director. Ellen Southard is the Puget Sound outreach manager for Salmon-Safe.